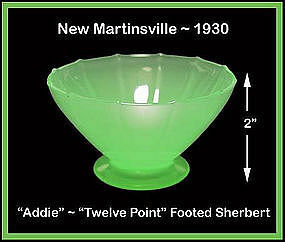 Addie Twelve Point jade footed sherbert in excellent condition. Outstanding! 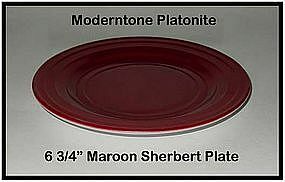 Moderntone Platonite burgandy or maroon 6 3/4" salad, or bread and butter plate in excellent condition. 1950's color. 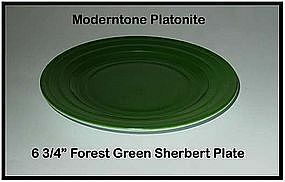 Moderntone Platonite forest green salad or bread and butter plate in excellent condition. 1950's color. 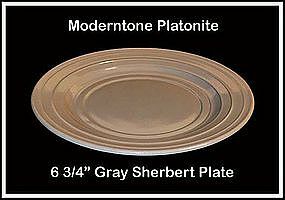 Moderntone Platonite gray sherbert plate in excellent condition. 1950's colors. 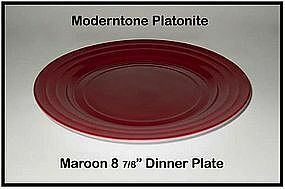 Moderntone Platonite Maroon dinner plate in excellent condition. 1950's color. 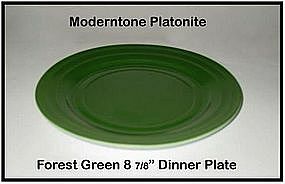 Moderntone Platonite forest green dinner plate in excellent condition. 1950's color. 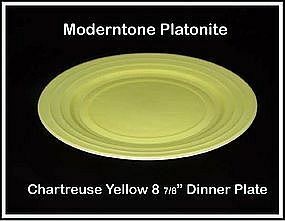 Moderntone Platonite chartreuse yellow dinner plate. 1950's color in excellent condition! 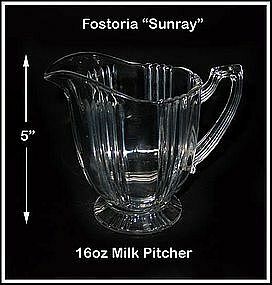 1930's Fostoria Sunray footed 16 oz milk pitcher. Minor use marks. Unusual size. 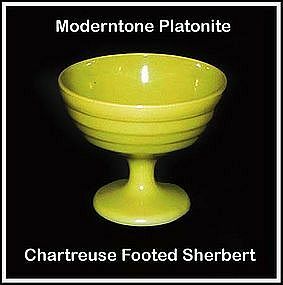 Chartreuse Moderntone Platonite footed sherbert in excellent condition. 1950's colors. 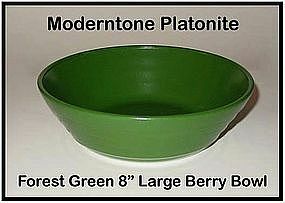 Dark Green large Moderntone Platonite 8" berry bowl in excellent condition. 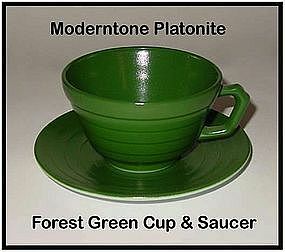 Dark Green Moderntone Platonite cup and saucer in excellent condition. 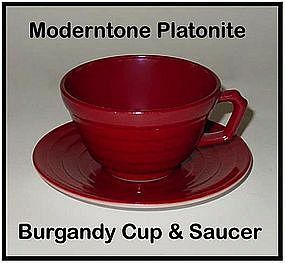 Maroon or Burgandy Platonite Moderntone cup and saucer in excellent condition. 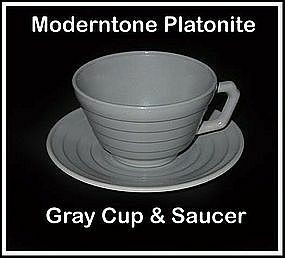 Gray Moderntone Platonite cup and saucer in excellent condition. 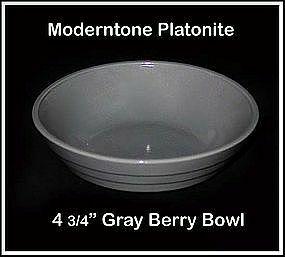 Gray Moderntone Platonite 4 3/4" gray berry bowl in excellent condition. No damage, no repairs. 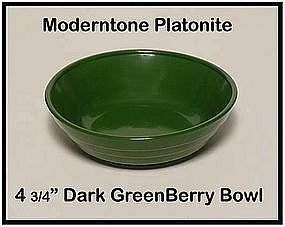 1950's dark colors Moderntone Platonite dark green berry bowl in excellent condition. No damage and no wear. 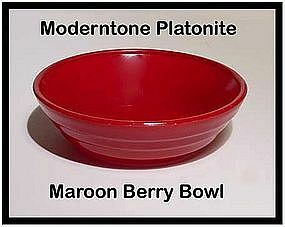 Burgandy or maroon berry bowl in Moderntone Platonite. Excellent condition with no damage or wear. We have more of these dark colors so keep an eye. 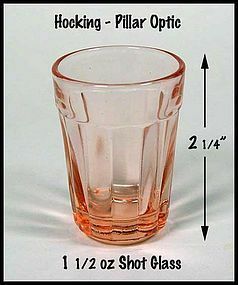 Pillar Optic pink 1 1/2 ounce shot glass in excellent condition. Made by Hocking Glass in the 1930's. Made only in 1942 by Hocking Glass Co, this pattern offered only 3 pieces for a luncheon set. 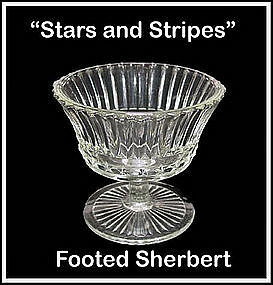 There was a plate, a footed tumbler, and a sherbert. This one is in excellent condition with no chips, no scratches, and no repairs.